Powerful, Easy-to-use, On the Cloud. Structural Analysis and Design Software Online, instantly from your web browser. SkyCiv is an online structural analysis and design software which is 100% cloud based. It works seamlessly on Mac, PC, and even mobile tablets! No more license keys, no more version issues or costly updates - just clean, powerful and easy structural analysis and design software. Get started in only 30 seconds. Did you know SkyCiv can handle plate elements, cables, buckling, p-delta and multiple load combinations for up to 20,000 members? On top of that, design models from AISC, NDS, ACI, Eurocode, Australian and Canadian standards are also fully built into the SkyCiv Structural Analysis and Design Software. A truly powerful cloud structural engineering software is finally here. 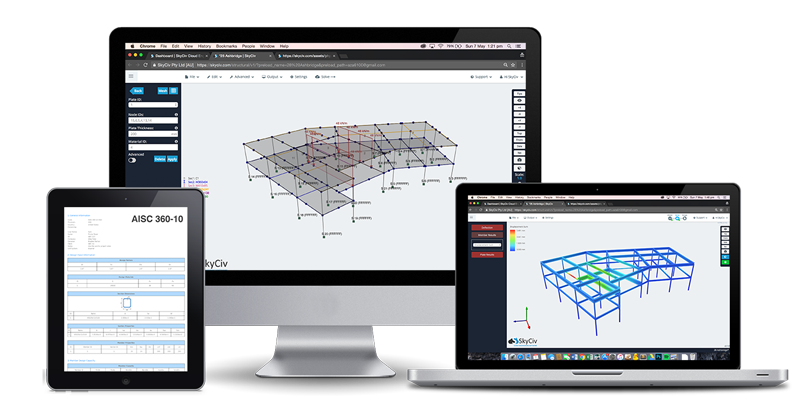 Different from traditional structural analysis and design software that are clunky and difficult to use, SkyCiv is very intuitive and easy to use. We've redesigned the workflow and user interface: with easier input and a cleaner interface, you can model 5x faster than some of our competitors. Turn your projects around faster with SkyCiv's responsive and helpful support. You can share your files with our support team in real time; Use chat and real time model repairs to get the help you need within a matter of hours, not days. Apart from that, our documentation provides a variety of tutorials, videos and articles to learn how to use our software. "The ease of use and the presentation of the results are both awesome. I have had ongoing interaction with the support team and everyone is excellent!" Powerful and easy-to-use engineering software that allows you to model, analyse and design any types of structures. With built-in steel member, concrete and connection design. Tailored pricing for students, professional, and enterprise. Fast and accurate software for 1D beams. Compatible with steel, wood and concrete modules. Simplified 2D software for tailored for Frame and Truss Structures. Useful for Students. Built into Structural 3D, design modules for steel, timber, concrete and wood are available for a range of regions including USA, Europe, Australia and Canada. Integrated and Standalone Design software for AISC, NDS, AS, Eurocode and CSA. Full calculation reporting available. Steel Connection Design Software for AISC 360, detailed reporting, CAD exporting and drawings. Design software for Reinforced Concrete Members in AS 3600, ACI 318 and EN2. Speed up your analysis process with easy-to-use modelling features. Model your structure faster and easier.